As a light and highly maneuverable ship, the TIE/ln fighter naturally attracts some of the most daring pilots in the Imperial Navy and the TIE/ln Fighter Expansion Pack includes pilots with a wide range of skills to contribute to your squadron. 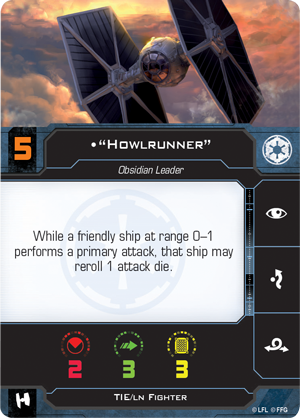 Some, like “Howlrunner” play to the TIE’s natural tendency to fly in tight groups. A born leader, she makes all the pilots around her better, letting them reroll one of their attack dice while they perform a primary attack. If you’re new to X-Wing, the TIE Fighter Expansion Pack comes with a pre-painted mini, and ship cards featuring unique pilots, upgrade cards, a maneuver dial, and the tokens you need for a single fighter. If you’ve already got the all the TIE fighters you need, you can instead pick up the Galactic Empire Conversion Kit, which has the same cardboard in it, just without the mini. I’m a Dash Rendar fan myself, so I’ll hold out for the Rebel Alliance Conversion Kit. Located in sunny Bellevue Washington, Dan is the owner of tabletop-test.com. He’s been playing board games and card games since he was a kid, and war games since 2010, when he started as a Press Ganger for Monsterpocalypse. Prior to that, he had a small collection of Imperial Fists Space Marines that never saw combat but definitely knew the horrors of a 10 year old with a paint brush.